I’m a pretty big fan of David Chang’s Momofuku restaurants. I even cooked through his entire cookbook! It’s no surprise then, that I thought I would be equally enthralled with the sweets from Momofuku Milk Bar, the dessert outpost of Momofuku. Unfortunately, when I visited the take-out Midtown version a couple of years ago, I was far from jumping with joy. I was most excited to try the real Crack Pie. Christina Tosi, the pastry chef at Milk Bar, has created a cult following for her pie. She’s been on Martha Stewart, in countless magazines, and her recipe is all over the internet. I made a version of her Crack Pie using the recipe printed in the LA Times and it was seriously delicious. The pie is a wonder of sweet and salty: oatmeal cookie crust with a sweet, gooey, butterscotch-like filling. I thought, if my homemade version is this good, the real thing is going to be even better! I guess I hyped it up in my head a little too much because ultimately, I was disappointed. The filling was completely different from the filling in my homemade Crack Pie. It was more of a tooth-achingly sweet cornstarch-y custard as opposed to the gooey, butterscotch-y filling I was expecting from the LA Times version. The bigger problem was: I didn’t like any of the things I tried at Milk Bar. Maybe it’s because the Milk Bars all get their goods delivered from the Milk Bar factory, or maybe it’s because baked goods never do well when scaled to massive commercial production, but the treats that were supposed to be whimsical and delightful fell flat for me. My disappointment with the real deal Crack Pie ran so deep that I wasn’t even excited when Mike gave me the Momofuku Milk Bar cookbook. I had been looking forward to it since making the Pie at home, but after tasting Tosi’s real version, I wasn’t too interested in the recipes. They looked too long, too convoluted and just too sweet. Even so, the book was an excellent read. I love books that give you a little insider peek how how a professional kitchen works. Tosi has a great story: she started out as a being a Jill of all trades for Chang, but her love for sweet stuff prevailed and now she’s a crazy famous pastry chef. I have mad respect for her. She took what she loved, ran with it and became incredibly successful. I figured I owed it to her to try out one of her recipes. I started out small and made the simplest thing in the book: liquid cheesecake. Apparently Tosi has a thing for barely-baked cheese cake. She came up with this recipe to layer with her carrot cake, but it tastes delicious on its own, in parfaits, or with fruit. The cheesecake is baked until barely set, so that it’s still pliable to spread or pipe. 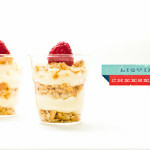 We had some in a parfait with some crushed Ritz crackers and raspberries and it was delicious. 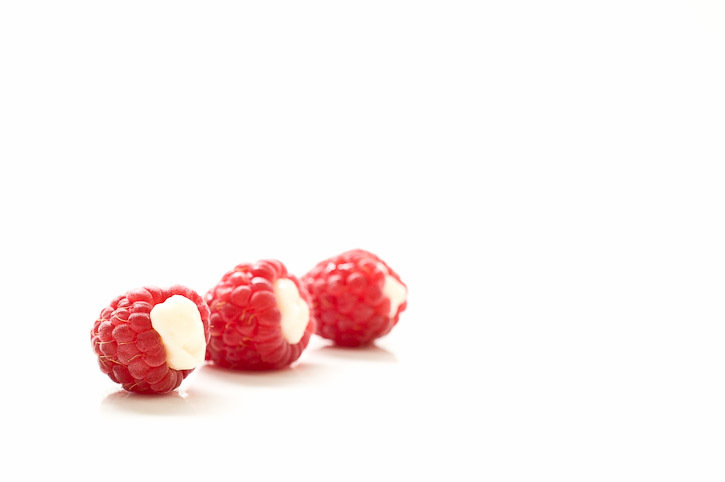 I also piped it into some raspberries for a one-bite treat. And, I must confess, I kind of did what Tosi herself does – ate it straight from the pan with a spoon. This recipe was a definite success in my books. I’m definitely going to be taking a close look at the rest of the recipes! 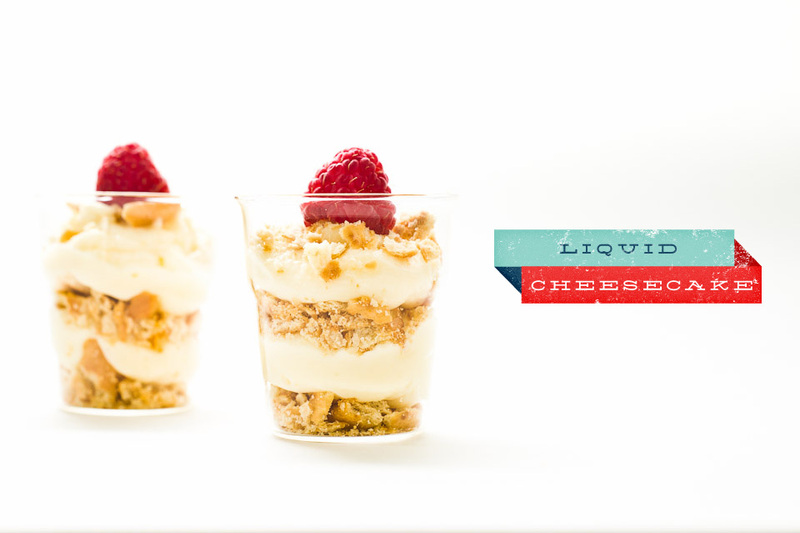 i am cheesy, i am squeezy: i am momofuku milk bar liquid cheesecake! Heat the oven to 300°F. Put the cream cheese in the bowl of a stand mixer and paddle on low speed for 2 minutes. Add the sugar and mix for 1-2 minutes until the sugar has been incorporated. Scrape down the sides as needed. In a bowl, whisk together the cornstarch and salt. Add the milk and egg and whisk until smooth. With the mixer on medium-low speed, stream in the cornstarch-egg mixture. Paddle for 3-4 minutes or until the mixture is smooth and loose. 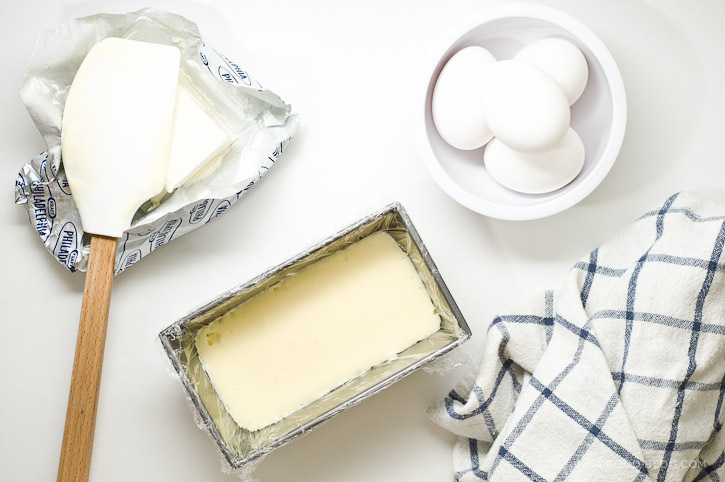 Line the bottom and sides of a 6×6 inch baking pan with plastic wrap. Pour the batter into the pan and bake for 15 minutes. Gently shake the pan. The cheesecake should be firmer and more set near the edges and jiggly and loose in the centre. If it needs it, give it 5 more minutes, check on it again and then another 5 more minutes if needed. If it rises more than a 1/4 inch or begins to brown, take it out immediately. I ended up baking mine for 25 minutes. Cool completely to finish the baking process. Once cool, the cheese cake can be kept for 1 week in the fridge. Enjoy spread on your favourite cookies, with fruit, cake or just on it’s own. I actually attempted the whole cake and it came out really well. So much work though–I guess that’s why I haven’t attempted anything else since. 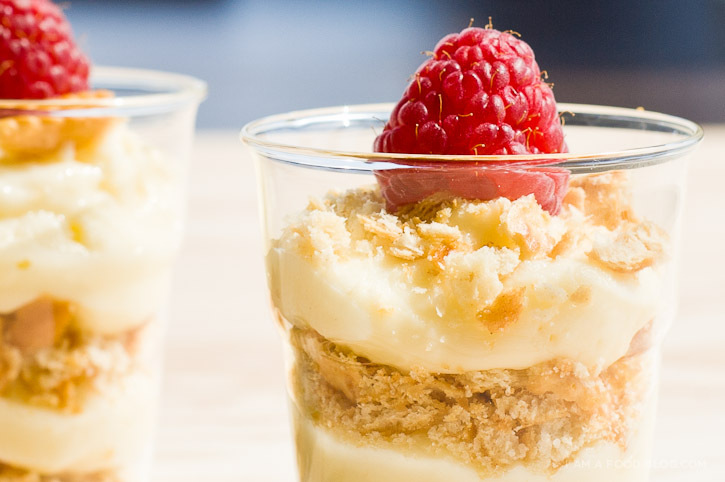 Your parfaits look like a great summer dessert. I can’t wait to make them and NOT have to make the whole crazy complicated cake. You are the PRETTIEST food blog! Oh my. And your photography is spectacular. I think this is what heaven looks like. I’ve gushed so much that I’ve lost weight. So now I will make this. Thank you! I love your blog so much I want to move here and live here. Forever. Take me!! this sounds so interesting… i too tend to enjoy the batter of whatever it is i decide to bake, so it’s good that this batter recipe is meant to be eaten! I was disappointed with Milk Bar, too. Stale cookies! What you’ve done here looks great, though. Looking forward to trying it. The recipes are a bit fiddly, but so far totally worth it. I’ve made the choc chip, marshmallow, cornflake crunch cookies; compost cookies; kim chi and blue cheese croissants; banana cream pie; cereal milk panacotta; bagel bombs; and blondie pie so far. I’ve been doing about one a week. I’ve never been this excited about cooking before. I’ll have to try one of the cheesecake recipes. I have never been to Milk Bar (Copenhagen is a bit far to just pop over for a cookie or some pie!) but I’ve tried a number of recipes from the book, and I have to say, they’ve been an unequivocal success. Best of the bunch so far: the pistachio layer cake. I’m not going to lie, it is a LOT of work. First, sourcing a bunch of ingredients that are not stocked in regular baking supply stores (not here in Denmark anyway). I couldn’t find pistachio paste, so had to make my own, adding a step to a recipe that’s already a somewhat intimidating project. BUT, when it all comes together, it is un-friggin’-believable. Certainly the best cake I’ve ever had, and I’ve had my fair share, and then some :-) Plus, the book has lots of bits and pieces (like the liquid cheese cake) that work well together with other recipes or even on their own. Staples in my kitchen now include the milk crumb, the chocolate crumb, several types of nut brittle and various cereal crunches. Try more of the recipes and I’m sure you will come around to this book. This came out fantastic! I used the Milk Bar Corn Cookie for the crust and filled it with Heath Bar and blueberries. Keep the great recipes coming! I like the parfait idea. Now you are ready to make the carrot layer cake! So this is where you are now! Was a follower on your momofuku for 2 blog and I even picked up that book as well as the milk book. Love this new blog, I’m already a follower! Agree with you about Milk Bar. I’m a big fan of the other Momofukus, but I always found Milk Bar to be too cloying, too sweet. (Although I like being able to get Pork Buns to go, which is the only reason I have for stepping in there.) I think Dave Chang’s ethos is all about Korean bar food, but elevated. It’s salty and umami because it’s meant to be washed down with beer. Tosi’s desserts work well in that context, just like a Pepsi becomes that much more palatable with movie popcorn. But out of that salty context, Milk Bar cookies and pies don’t do it for me, and I’m mystified by their popularity. At least at home you can tone down the sweetness. I do like some of Tosi’s ideas, which seem to take nostalgia for childhood treats (cereal, McD’s apple pie, etc.) and elevate them. Just like Chang seems to be nostalgic about soju bars, although in my opinion Ssam/Noodle go much deeper than Milk Bar. BTW love the blog! Ended up here from your Momofuku2go. Does the plastic wrap not melt? Birthday cake, compost cookies, pistachio layer cake and carrot layer cake recipes are AMAZING. Keep baking from this book, you won’t be disappointed! It doesn’t melt, but if you’re concerned, skip the plastic wrap. I made a double batch…my plastic wrap melted. I did have to bake it longer because of quantity so next time i’ll skip the plastic wrap. It was a bit too sweet in my opinion. The graham frosting from the carrot cake recipe is to die for though! Oh no! I was worried that my wrap would melt too, but thankfully it didn’t! I should try the graham frosting! I have the book too and have had success with everything I have tried (Crack Pie, Cornflake Crunch, Cornflake Marshmallow Cookies, Carrot Cake, Graham Frosting, Milk Crumb), except Cereal Milk Panna Cotta. The flavor was right but I couldn’t get the correct consistency despite trying to fix the Gelatin quantity twice. I tried a few treats from the store and they don’t compare to my homemade versions either. Which was actually for me a relief because I just assumed I was hacking her complicated recipes. People in my office went nuts for the Carrot Cake and Graham Frosting. And it wasn’t too hard. I put a graham crumb/milk crumb combo on top to add crunch and it was a winner. QUESTION: I am having a Mexican Anniversary Dinner Party this weekend and want to make individual Key Lime Jar-Pies… Thinking to combine a few Milk Bar recipes to achieve this. Does anyone know if I could just add Key Lime to this Liquid Cheesecake recipe? Other suggestions? Hello! Thank you for your blog. It’s very pretty. I’m a long way from the NYC restaurant and bakery so I have not tried any of the actual foods from Momofuku, but I have made Birthday Cake – Twice.. and despite the toothaching sweetness, the cakes and scraps got eaten up, nothing left by day two. Your post inspires me to get the cookbook and try more recipes. i didn’t have any problems, but if it concerns you, i think it’ll work just as well without the plastic wrap!